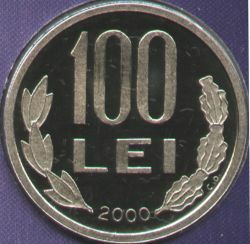 denomination "100 LEI" and year 2000. At the right rim lies C.D. standing for Constantin Dumitrescu, the engraver's name. Ornaments: leaves. 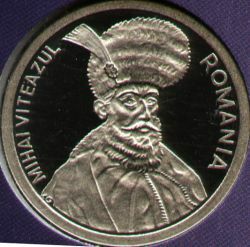 MIHAI VITEAZUL meaning MICHAEL THE BRAVE, his bust and ROMANIA. On the right shoulder lies C.D. standing for Constantin Dumitrescu, the engraver's name. 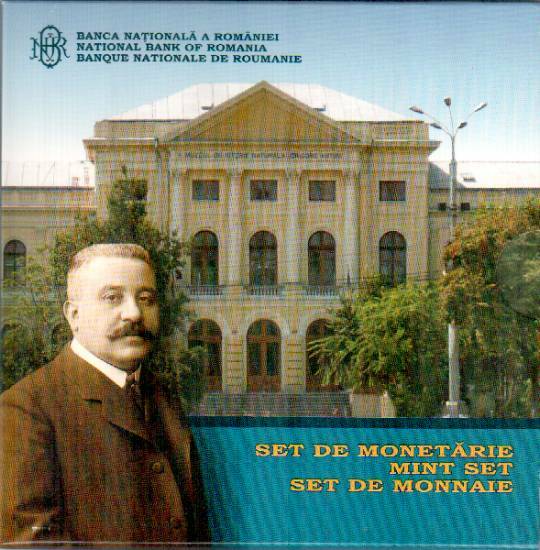 This coin was sold by the National Bank of Romania in a "Romanian Circulation Coins Set". The set comprises coins from 1 leu to 1000 lei, all under 500 lei not having real payment value in the year 2000 when they were struck. The pictures below present the envelopes of the mint sets issued by NBR. The set presenting only the four new coins of the 2005 reform was not included here, for it contains the bussiness strike - plain regular - coins (press here to see this set). NBR issued 5000 of these sets. The set contains the 1 leu, 5, 10, 20, 50, 100, 500 and 1000 lei coins. 1.000 de sets were minted. This set was released in December 2000 and does not contain a medal, as all the following sets do. 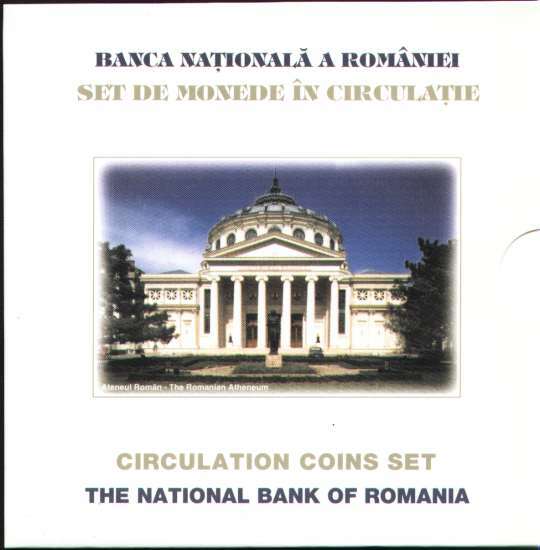 Just like all the Romanian silver and gold anniversary coins these pretended circulation coins have two regions of roughness. The lower region is a shiny, mirroring one, whereas the higher (corresponding to the details, letters, digits) has been polished in order to obtain a somewhat frosty gloss - a.k.a. proof quality. So, not only such coins never circulated, but moreover, coins alike these were never found in the pockets of the Romanians. They are very different to the real circulation pieces. Just like the real circulation coins, these pieces must be turned around the horizontal axis to see their both faces in normal position. 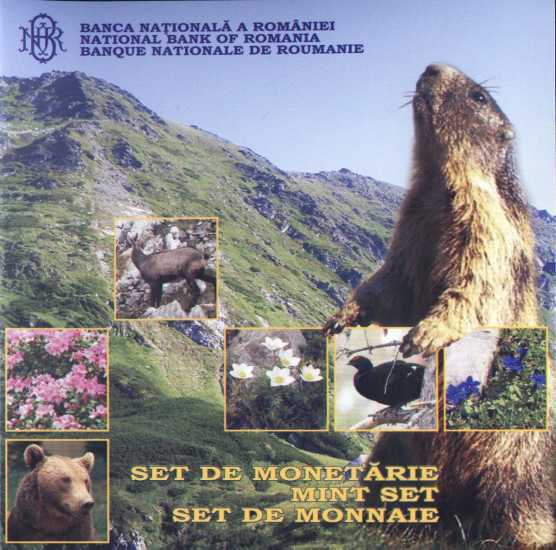 The image of the 2000 set is present on this page through the kind permission of Mr. Radu Lissner. 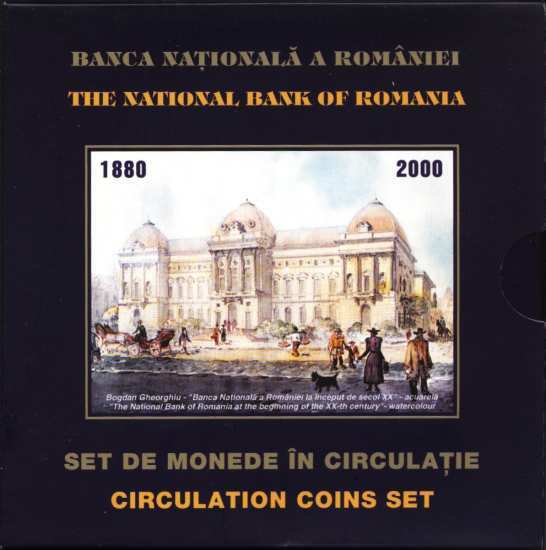 The set contains the 1 leu, 5, 10, 20, 50, 100, 500 ans 1000 lei coins and a medal celebrating 120 years from the establishing of the National Bank of Romania. 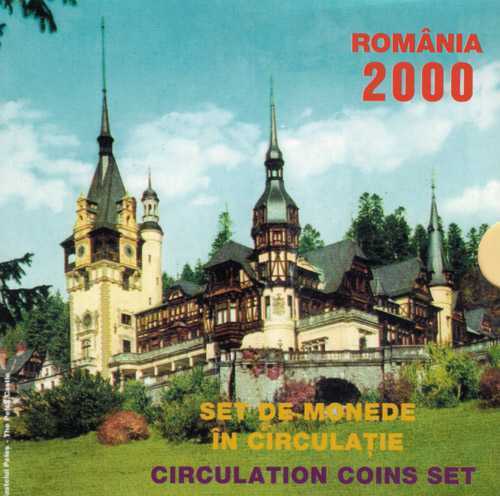 Although the coins bear the year 2000, the set was sold to the public in 2001. 5000 sets were minted. It seems that, for reasons unknown to us, in some of these sets the 1000 lei coin bear year 2001 instead of 2000. The image above is present on this page through the kind permission of Mr. Radu Lissner. Unlike the real circulation coins, these pieces must be turned around the vertical axis to see their both faces in normal position - the regular must be turned around the horizontal axis. In 2002 another set of such coins was issued, also comprising the new 5000 lei coin. The medal that accompanies the set is dedicated to the annual conference of EBRD (European Bank for Reconstruction and Development), conference held in Bucharest in Mai 2002. 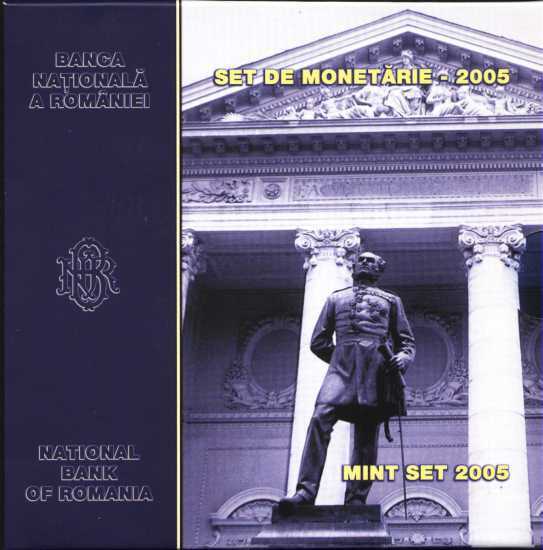 The mintage of the later was of 1.500 sets, being sold for 310.000 lei (about 10 $ - expensive in 2002!). 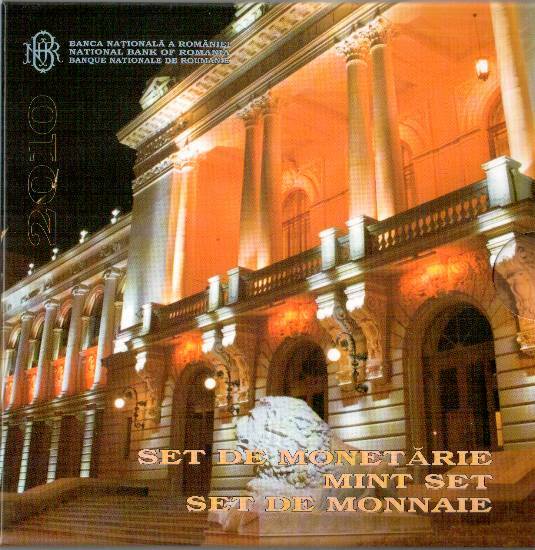 The 2003 set comprises the 1 leu, 5, 10, 20, 50, 100, 500, 1000 and 5000 lei coins and a medal, 170 years from the construction of the Şuţu Palace. Today in this palace functions the Museum of the City of Bucharest. 10.000 of these sets were issued. The 2004 set was offered for sale just a few days before Christmas. It comprises only the values of 1 leu, 100, 500, 1000 and 5000 lei. The set medal celebrates the 50th anniversary of the inauguration of the Bucharest Opera House. 2.000 of these sets were issued. 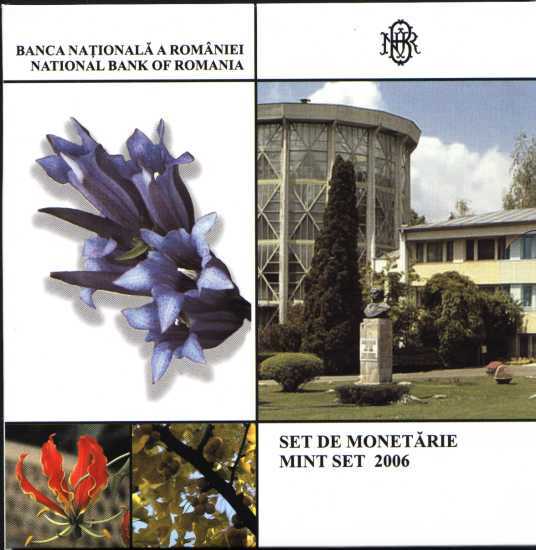 The 2005 mint set comprises, besides the coins present in the 2004 set, the new 1 ban, 5, 10 and 50 bani entered into circulation at July 1st 2005 (also proof). The set medal is dedicated to the 115th (???) anniversary of the establishing of the building of the University of Medicine and Pharmacy "Carol Davila" of Bucharest. 2.000 of these sets were issued. 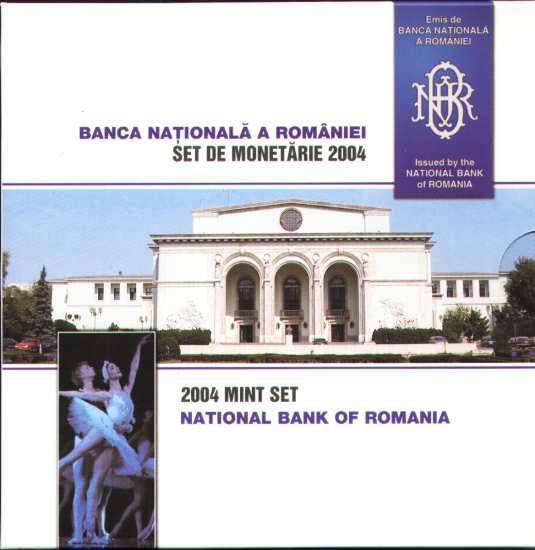 The 2006 set comprises all the coins from the 2005 set: the new 1 ban, 5, 10 and 50 bani coins that entered into circulation at July 1st 2005, and the old coins, existing in the 2004 set. Quite unusual, since the old coins have the old nominal values; so the NBR struck in 2006 for the circulation set coins that do not exist as bussiness strike as all remaining of their type are to be replaced. The medal is dedicated to the 150th anniversary of the establishing of the Botanical Garden "Anastasie Fătu" of Iaşi. 1.000 of these sets were issued. The 2007 mint set comprises the new 1 ban, 5, 10 and 50 bani entered into circulation at July 1st 2005. The set medal is dedicated to the 75th anniversary of the establishing of the Rodna Mountains National Park. 1.000 of these sets were issued. 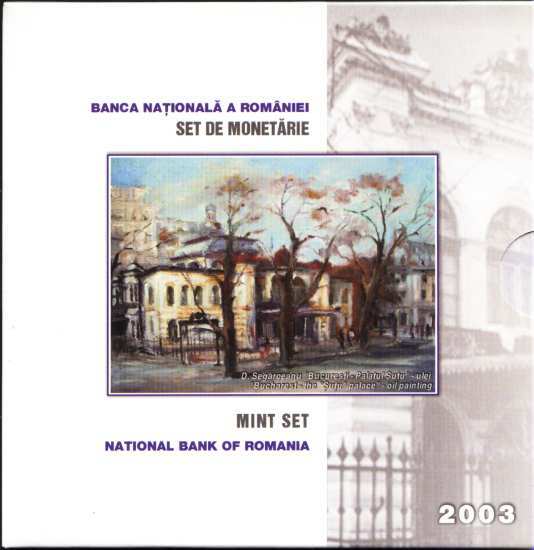 The 2008 mint set comprises the new 1 ban, 5, 10 and 50 bani entered into circulation at July 1st 2005. 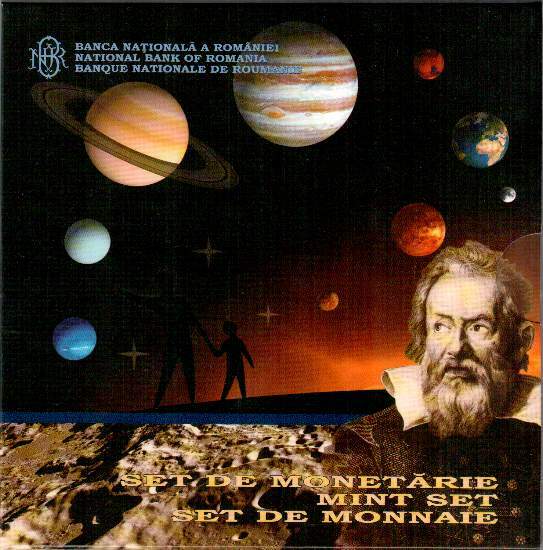 The set medal is dedicated to the "Grigore Antipa" Natural Science National Museum in Bucharest. 1.000 of these sets were issued. The 2009 mint set comprises the new 1 ban, 5, 10 and 50 bani entered into circulation at July 1st 2005. The set medal is dedicated to the International Year of Astronomy. 1.000 of these sets were issued. The 2010 mint set comprises the 1 ban, 5, 10 and 50 bani that entered circulation at July 1st 2005. It also comprises the anniversary coin of 50 bani dedicated to Aurel Vlaicu and his plane, in a proof variant with faces placed in medal style. The set medal is dedicated to the anniversary of 150 years since the foundation of the 1st modern Romanian University in the city of Iaşi, nowadays called "Alexandru Ioan Cuza" after the prince that founded it. 1.000 of these sets were issued.